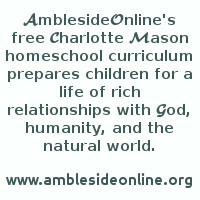 Note: The AO curriculum is incomplete without a thorough understanding of Charlotte Mason's ideas and methods and requires that you invest time to familiarize yourself with her philosophy by reading her books. In addition, AO's FAQ addresses questions that people commonly ask about the curriculum. In addition to the books, the following subjects should be scheduled daily or weekly. as scheduled for Nature Study. Select a program that meets your family's needs from our page of Math Options. 1. It is preferable for a child to become accustomed to the language and flow of the King James Version of the Bible, as a familiarity with King James English will make other literature more accessible. Please read Lynn Bruce's article on the King James Version by clicking here. The weekly schedule lists readings taken from J. Paterson Smyth's commentaries, with Old Testament readings focusing on Exodus and the life of Moses, and New Testament in the book of Luke. (see AO's Bible plan) Charlotte Mason taught both with commentaries, reading the Bible passage first, then narration, then reading the commentary, but Smyth's commentaries may reflect the doctrine of his era and denomination; they are not necessary to follow the Bible schedule. 7. Trial and Triumph: Descriptions of some trials of the Christians may be intense; parents should preview chapters to determine suitablity based on their children's sensitivities. If you prefer, you can skip this book and cover church history in Years 7-9 with a different book, Saints and Heroes, by George Hodges. This book tells church history from a definite Protestant perspective; some families may wish to skip this book or find an alternative. The Following geography concepts should be explained and taught this year; a book is not necessary as these can be explained informally during walks and outings. AO's complete list of geography topics is here.